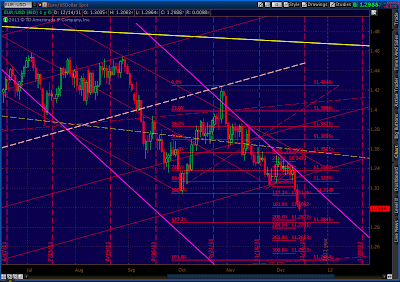 Update on EUR and DX. 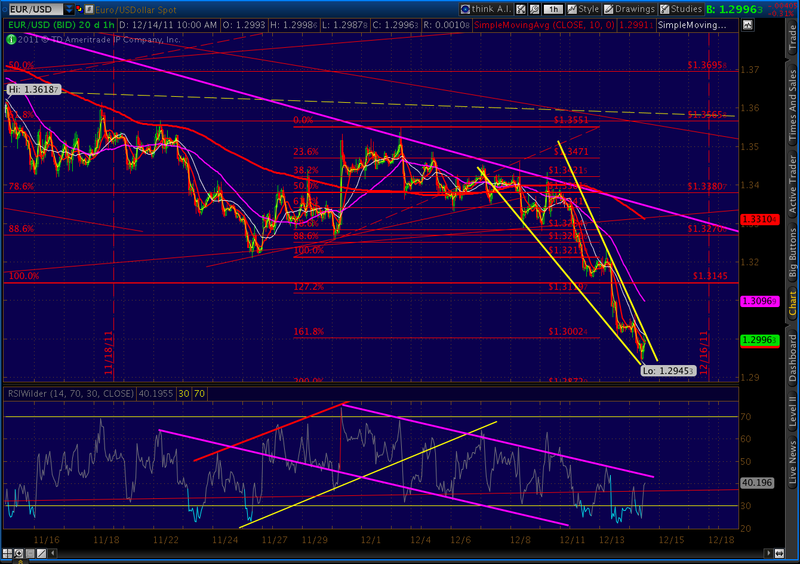 Both are in a wedge, but with scant signs of divergence yet. We could see a reversal any minute, but the key is whether there’s a break out — not just a move within the wedge. My best guess is EURUSD is going to want to back test the psychologically important 1.30 level. 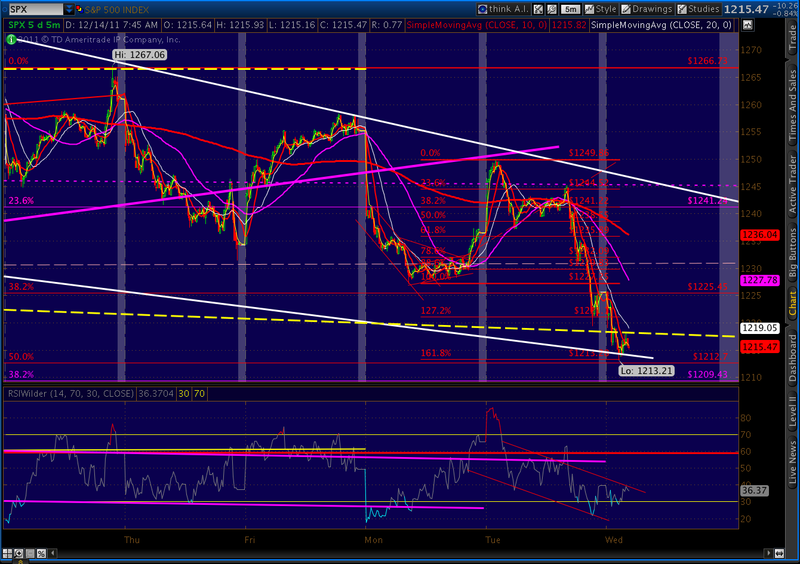 Note the solid red line now just below DX. That’s the fan line we talked about last night (this morning!?!). It runs from the April 08 lows through the Feb 14 and Oct 4 highs. We should expect at least a little back test here. 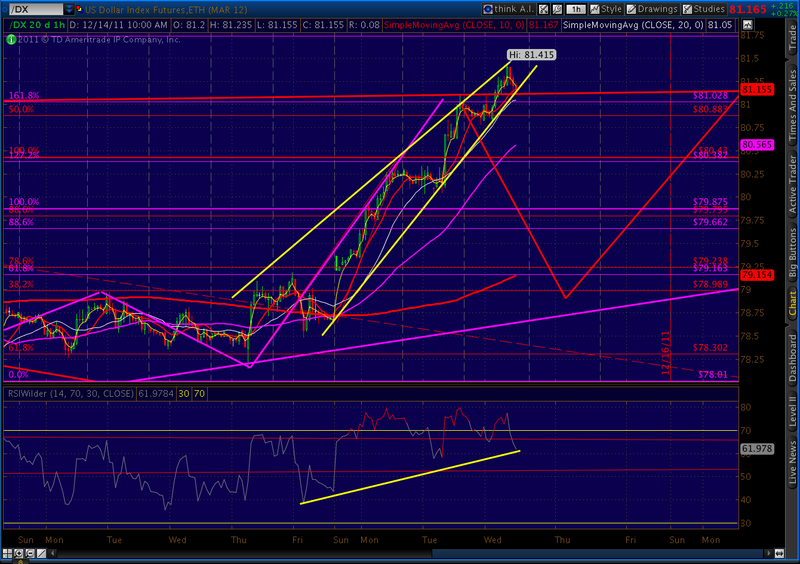 DX appears to be backtesting the 1.618, otherwise still going strong. 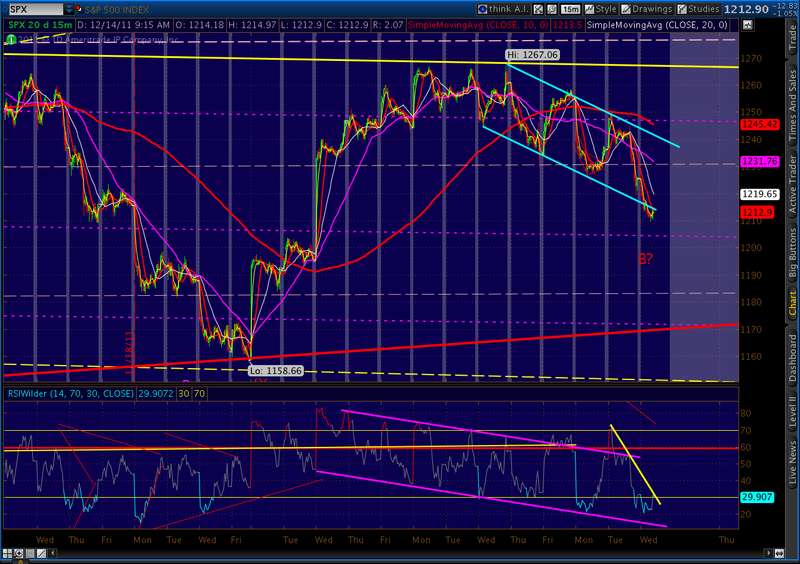 Note the RSI seems to be testing its trendline. The next move should be higher. 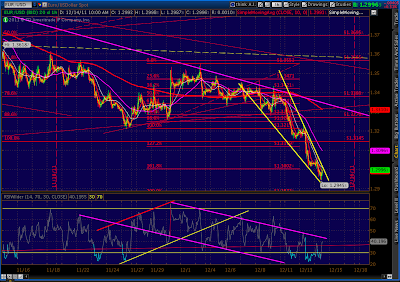 This correlates with the opposite move in EURUSD. SPX trying to dig in, here. 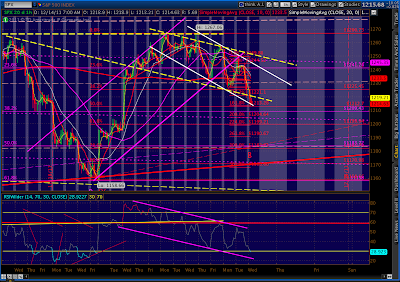 It appears as though we broke the white channel and are backtesting it. 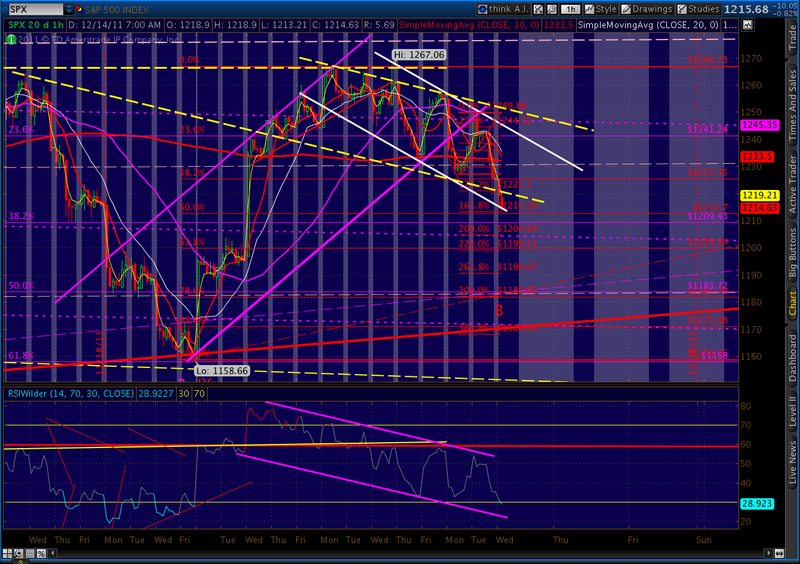 The RSI channel story indicates further downside. 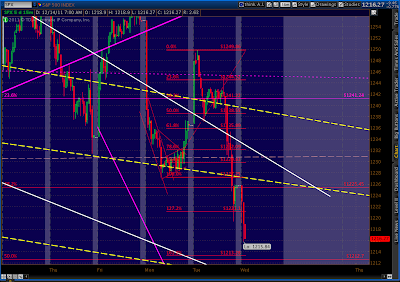 But, I’m also keeping an eye on some potential resistance from a previously established channel. It’s not a great channel, having been penetrated on both the upside and downside. But, it might come into play here. 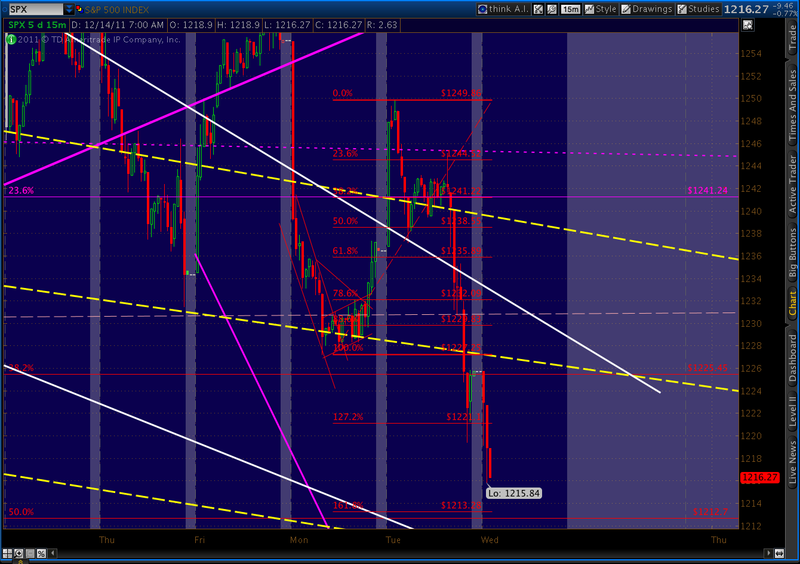 It’s shown below as the purple lines. As we approach the .382 Fib of the 1074 — 1292 advance (1209.43) it’s probably a good time to review the harmonic picture for SPX. I have two patterns shown on the chart above. 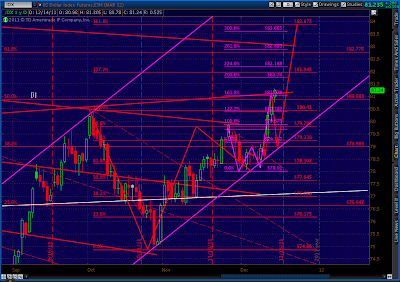 The purple pattern is a Gartley in the making. 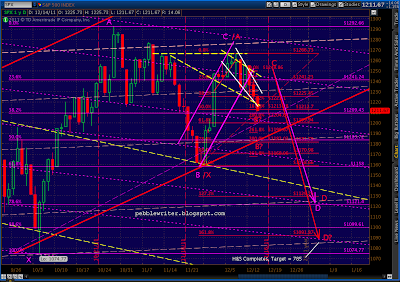 Point B hit the .618 retracement exactly, and the .786 looms up ahead at 1121. 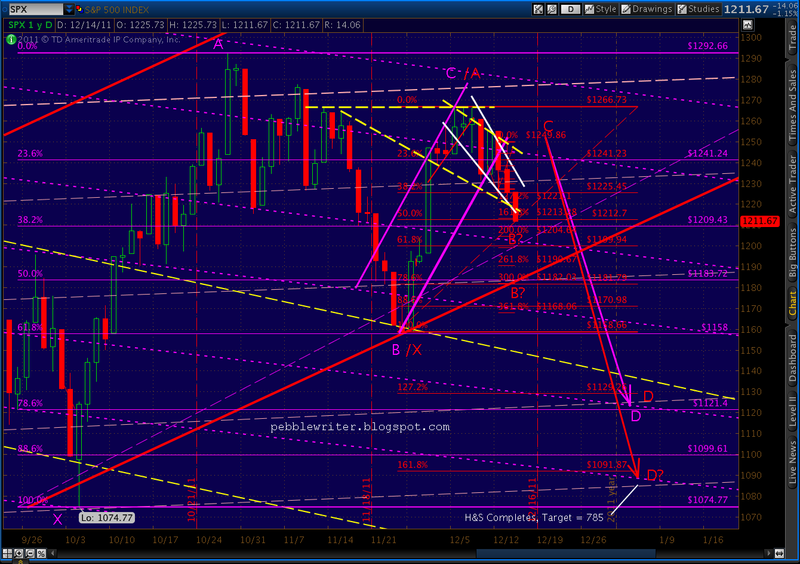 If it reverses at its .618 (1200), it’s likely a Gartley with its own .786 target (1182.) 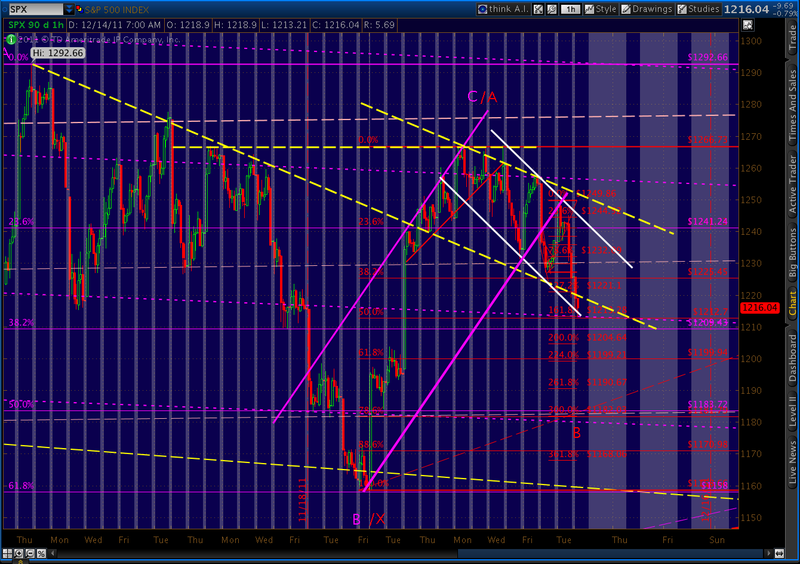 If it continues as far as the .786 at 1182, it’s a Butterfly with a target of the 1.272 extension at 1129. 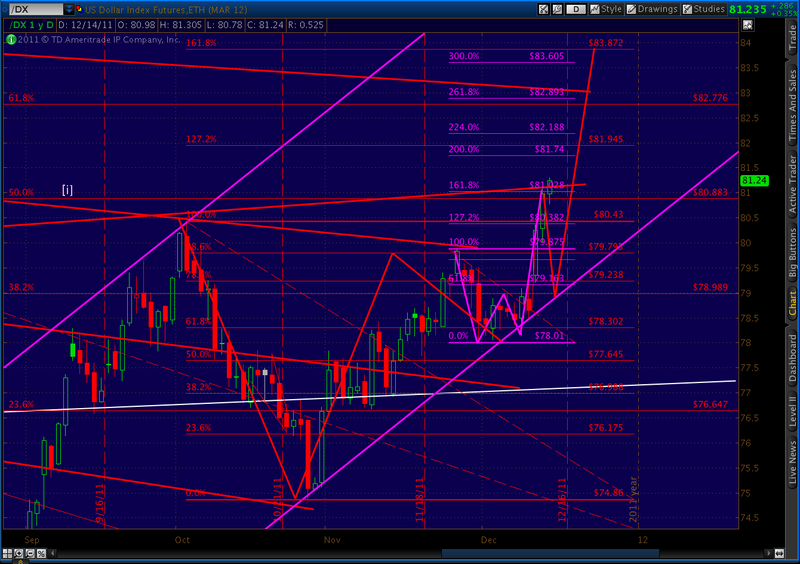 One critical requirement of a Crab is that its Point B come in at less than a .618 retracement of the XA leg. So, Gartley’s can and do extend to become Crabs — meaning, again, the 1.618 extension to 1091. At some point in this decline, we’ll take a meaningful pause. The dollar and euro need to consolidate, too. 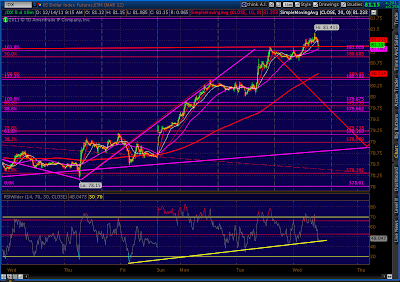 DX spent three weeks consolidating around the .382 Fib level, and so far a mere 24 hours around the .500 level. A logical spot would be a backtest (of everything) at around 1200. I think it’s psychologically important to investors and, as mentioned above, it’s an important .618 Fib retracement of the powerful advance we saw between Nov 25 and Dec 5. But, wherever we do reverse, it’ll be to set up a Point C in the smaller, red pattern and begin the more serious decline to Points D on both patterns. One point to remember: a rebound higher than 1266 means we’re likely going to put in one last high (1307-1313) before the next wave down. I don’t expect it, but I feel obligated to keep mentioning it until it’s out of the picture. There are two other dangers lurking out there for bears. I still think there’s a good possibility that, on any meaningful rally, we’ll get close to completing an inverse head & shoulders pattern — just to shake out some bears and trap a lot of bulls. 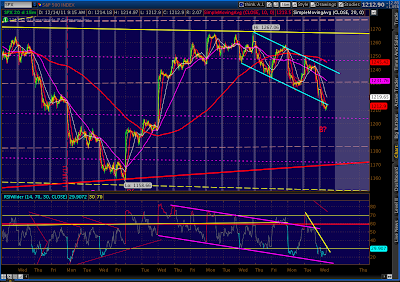 I talked about this extensively last week; a bounce to 1255 or so would do it. 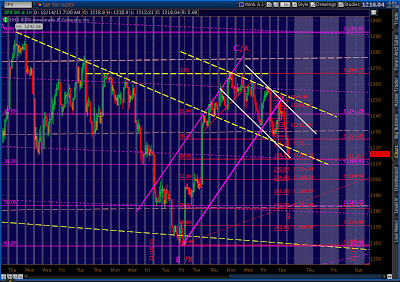 Note that 1255 would correspond with the TL (yellow, dashed) off the July highs. 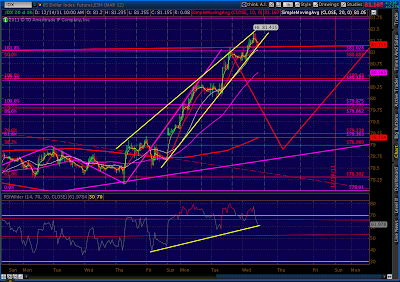 I’ve drawn the IHS neckline as a solid yellow line. See the Dec 9 post for charts of this and the several previous fake-outs. If we were to reverse here at 1209, a .786 retrace would get us to 1255. 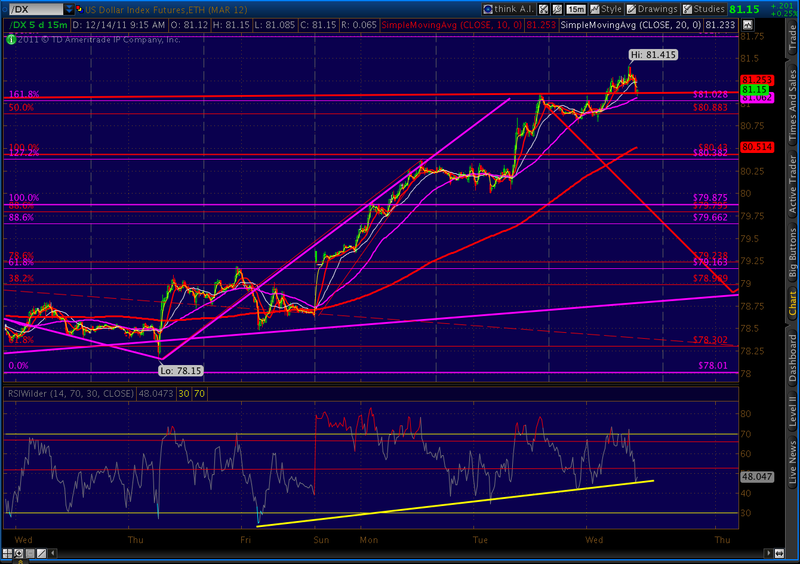 From 1200, a .786 retrace would reach 1252. We’re also nearing the lower boundary of the channel that’s guided the upside since the 1074 lows (the broad, red channel.) 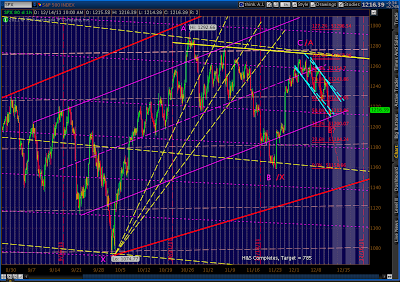 We could easily see a decent bounce here, as it also represents a major fan line. Note how the three previous fan lines off 1074 (the yellow, dashed lines) provided a bounce before they were eventually broken. 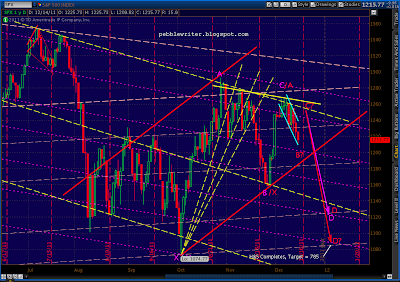 SPX tagged our 1213.28 target (1213.21…close enough) and is lingering in the 1215 range. It’s not oversold on any of my charts, but is pausing after completing the Crab pattern at the 1.618 extension, backtesting the yellow channel and tagging the white channel. I’m watching the 5-min and 15-min charts (note the RSI channel) for signs of a reversal, but the bears are still driving this bus — for now. This is always the hardest part of investing, for me — letting profits run. The temptation is to take profits in anticipation of a turn, but as we’ve learned so many times over the past few months, this market has been marked by excesses and throw overs. Ron Walker has an interesting technique, where he watches moving averages on the 5-min and 15-min charts intra-day. In an ideal falling market, the 10-period MA would be lower than than the 20 which would be lower than the 50 — the “moving average trio” he calls it. It works pretty well, except when we get into periods of chop. Then, one can look to the 15-min chart and observe the same MA’s. When they get out of align (e.g. the 10 crosses above the 20) it’s a sign of a shift in momentum. 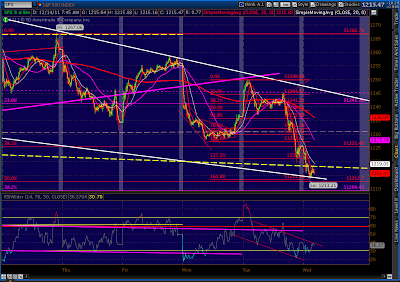 I like to also look at RSI trend lines and channels, as they tell a similar story in a different way. Confirmation is always good. Between the horrid Italian auction (6.47% on 5 yrs), China hitting US car co’s with duties, etc… it’s possible that’s all the consolidation we’re going to see at all those 1.618 Fib extensions mentioned yesterday. Crabs can and do continue out to larger extensions (2.0, 2.24, 2.618, 3.0, 3.618), it’s just that the 1.618 is the most common reversal. Best to keep a close eye on things and see where the momentum takes us. 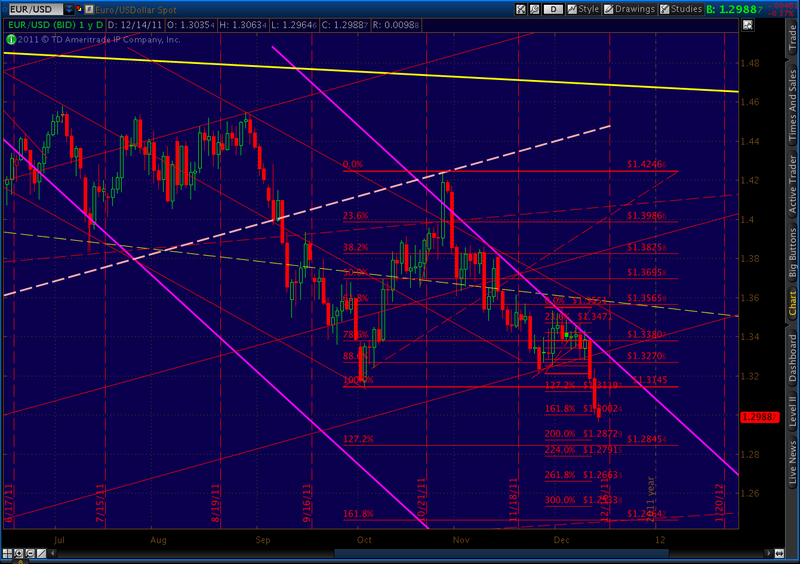 Next target on EUR/USD is completion of another larger Crab at 1.2464. Although, we’ve backed away from the channel boundary, so there’s potentially more time for the pattern to complete. 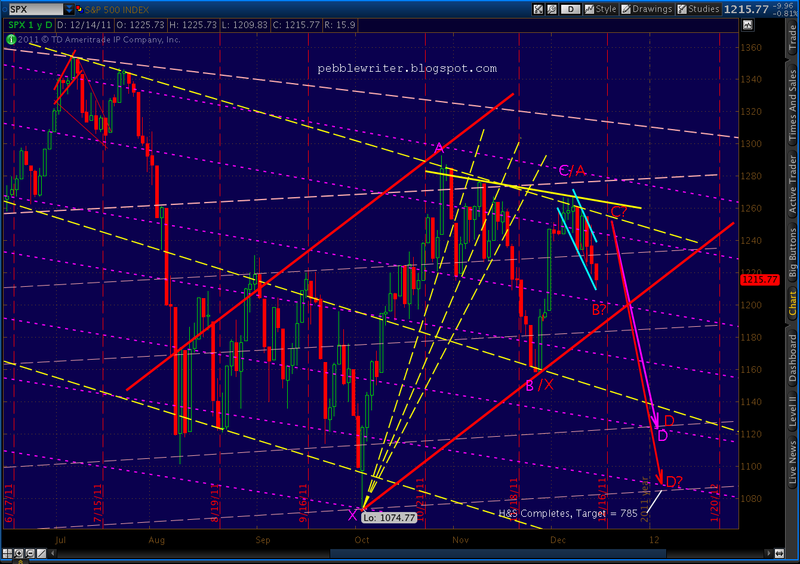 I don’t think it will, but it could take as long as the end of January and still stay within the channel. 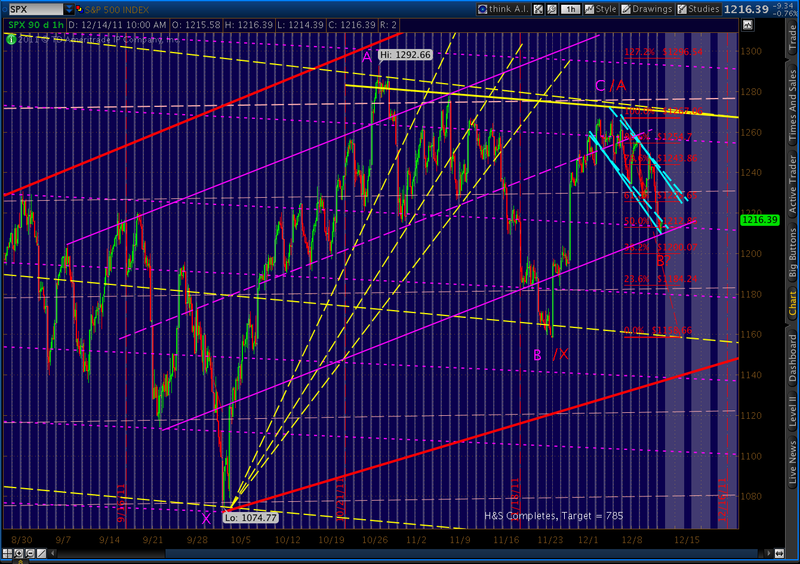 SPX is working on its own little Crab pattern that completes at 1213.28. Monday, I proposed a new, steeper channel (shown in white) to guide the downside. Its slope is around 30 pts per week. Now, we’re already bumping up against the lower boundary of that channel, too. 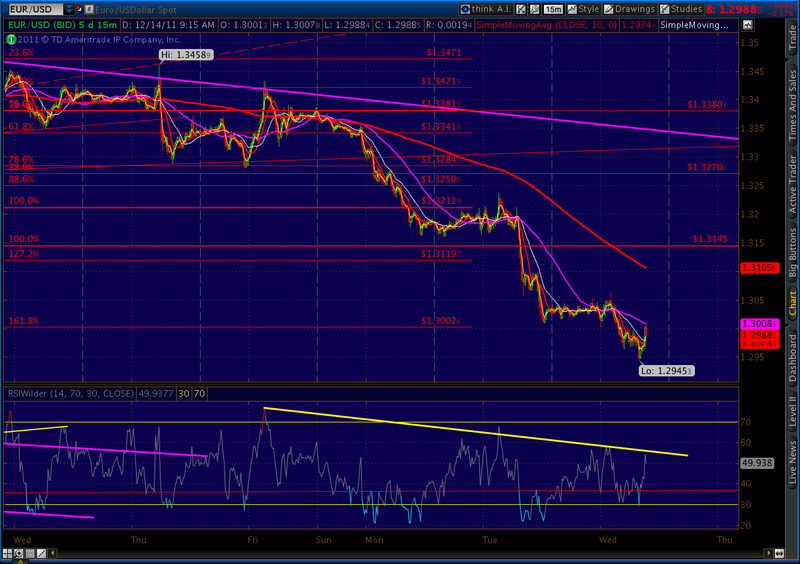 We also just hit the above-mentioned 1.618 target of 1213.21 – so things are moving fast.